Later this month, nearly 20,000 librarians, library workers, and other information professionals will descend on the city of San Francisco for the annual conference of the American Library Association (ALA). They will arrive by airplanes, by bridges, and by freeways. But in 1891, when San Francisco played host to the ALA’s first ever West Coast conference (Bertram 2015), the story of their arrival was extraordinary: the ALA commissioned a private steam train to transport over half of the conference attendees on a five-week, round-trip transcontinental train ride. It was an amazing odyssey that would crescendo in a tumultuous scene on the return ride home: an impromptu but official conference session aboard the moving train. Picture the ALA president Samuel Swett Green struggling to keep both his feet and order as association members argued over whether to override a committee vote and change the planned location of the following year’s conference, all while he was waving around a Native American warclub in lieu of a gavel. Where to host the conference was a recurring controversy. The original suggestion to situate the 1891 conference in San Francisco was itself contentious: at the 1890 Fabyan House conference, Herbert Putnam, then the City Librarian of Minneapolis, submitted a letter charging the ALA with “making excursions” and not accomplishing enough business at its annual meetings (ALA 1890, 124). It fell to John Vance Cheney, a poet recently appointed the Librarian of San Francisco, to convince the conventioneers to travel west the following year. “Now if you were a selfish body, California could address you on the selfish side. But I utterly waive that. 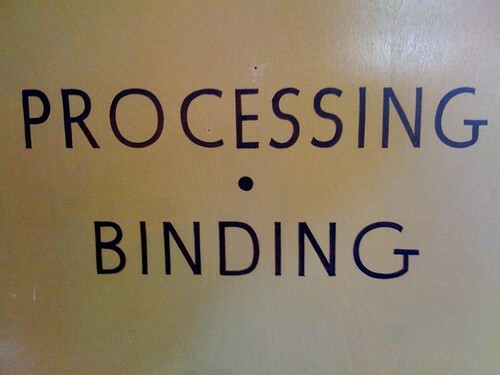 I wish to put that out of your minds as much as possible. Think first of your duty” (ALA 1890, 125). Mr. Cheney proceeded to make the case that it was ALA’s duty and responsibility to travel to California; the state needed funding for library buildings and the arrival of the conference would sway the minds of politicians and the newspapers and inspire a library boom. “We have money; we have some books, but we need library buildings. Why, you who sit here in the centres of culture, you who sit here in your old world complacency, know not the need of us who wrestle in the sagebrush and track the yellow sands of the prairie” (ALA 1890, 125). I’ll allow Mr. Cheney his poetic license, but there is no sagebrush or prairie in San Francisco. However, he did have to fight constant battles to obtain dedicated space for San Francisco’s public library. By 1891, he had managed to move the main branch from an abandoned, fire-prone theater to a wing of City Hall, but space was still cramped and inadequate. When the conference commenced, there were public sessions on the cultural importance of public libraries and another focused on library architecture, both of which held the potential to inspire the funding of library construction (towards that goal, it failed: San Francisco would not have a freestanding Main Library until Andrew Carnegie helped fund its construction in the 1910s). The librarians of Denver and Chicago both spoke in favor of a San Francisco conference, and Boston’s Charles A. Cutter, the beloved cataloging pioneer still remembered today for his “cutter numbers” spoke up to defend excursions and unofficial business at conferences: “I also come to join in the little talks on the train, in the lobby, and on the excursions, for these talks give us fully as much benefit as anything that goes on at the regular meetings. [...] So I second this motion, because I wish to see a mountain with a snow line, as well as one with a tree line. Also, I should like to see Mr. Cheney wrestle in a sage brush” (ALA 1890, 125). The resulting vote turned out to be unanimous. As 1890’s ALA President Frederick Crunden said, “Oratory, poetry, and cold facts all call us west” (ALA 1890, 126). The Association was going to California. That smiling face belonged to Frank P. Hill, the Librarian of Newark, New Jersey and the new ALA Secretary, succeeding Melvil Dewey. It had fallen to him to somehow move the East Coast-based library establishment west. He settled on a uniquely luxurious travel experience: he reserved an entire train that would tour the librarians across the country, from New York to San Francisco, and back again, with westward stops in Chicago, Denver, Sacramento, and an eastward sojourn through the southwest, starting with Santa Cruz, Southern California, a day trip into Mexico and a ride across the territories of Arizona and New Mexico. It cost $250.00 to travel from the East Coast, and slightly less if you were boarding in Pittsburgh or further points west. The fare covered a double-berth in a sleeping car, all meals, side trips, and excursion hotels. Cost-conscious travelers could share a double-berth, or fifty extra dollars would get you an entire sleeping compartment to yourself (ALA 1891, 4). By the time the train pulled out of Chicago, 41 librarians were aboard, or roughly half of the conference attendees, all engaging in professional chatter for the span of the trip. D.V.R. Johnston, Sub-librarian of New York, chronicled the westward journey for ALA, and wrote that “it was understood that each individual possessed at least one new idea on library matters, we all set to work to interchange — a work, by the way, which completely lasted out the trip” (Johnson 1892, 130). Mr. Hill didn’t book just any train: he commandeered the pinnacle of railroad luxury, the Pullman Palace Cars of the Pennsylvania Railroad. A published tour itinerary went into detail about the train’s magnificence, declaring it “by universal verdict [...] the handsomest and best appointed passenger train in existence” (ALA 1891, 7). 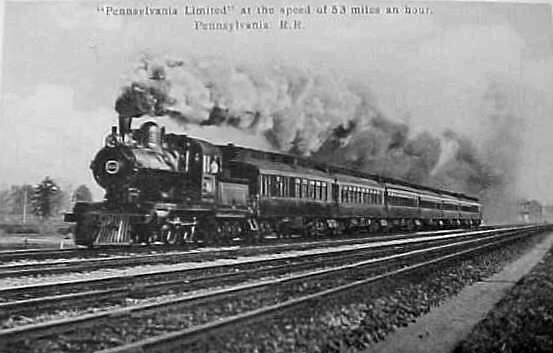 The vestibuled train featured two drawing-room sleeping cars, a dining car, and a “composite smoking car.” The librarians would be accompanied by a “Tourist Agent” and an “Experienced Lady as Chaperon,” furnished by the Pennsylvania Railroad. The composite smoking car was the social nexus of the train ride: “A compartment introduced between the baggage-room and the main saloon is fitted up as a barber-shop and bath-room. A regular barber’s chair and all the paraphernalia of the tonsorial artist are at hand. The rear section of the car is a smoking-room, furnished with comfortable rattan arm-chairs, a lounge, and two writing-desks, each surmounted by a small case of selected books” (ALA 1891, 7). The sleeping quarters could accommodate both men and women: “The Pullman Vestibule Sleeping Cars composing this train are the best examples of nineteenth century car building. Each contains twelve sections of two double berths, and two drawing-rooms, containing two double berths and a sofa. Inclosed toilet-rooms for ladies and gentlemen occupy separate ends of the car” (ALA 1891, 7-8). In describing the dining car, the itinerary rhapsodizes that “glistening silver and glassware vie in brilliancy with the spotless linen, and above the tables, in the spaces between the windows, potted plants are placed on shelves set in the hardwood” (ALA 1891, 8). The train departed from Jersey City on Thursday, October 1st, stopping in Philadelphia to pick up additional librarians (the Boston contingent had arrived on the Boston and Philadelphia Night Express that morning). They would continue collecting librarians in Harrisburg, Pittsburgh, and Fort Wayne. On Friday, October 2nd, they took a long stop in Chicago, so that the passengers could to tour the Chicago libraries, plus an unscheduled stop in Ottumwa, Iowa to spend a few minutes at a county fair running at “full blast” (Johnston 1892, 130). Since Denver, Colorado, was farther west than most attendees had likely ever been, it merited a two-day stay, as it was “one of the most pushing and cultured cities of the plains” (ALA 1891, 9). 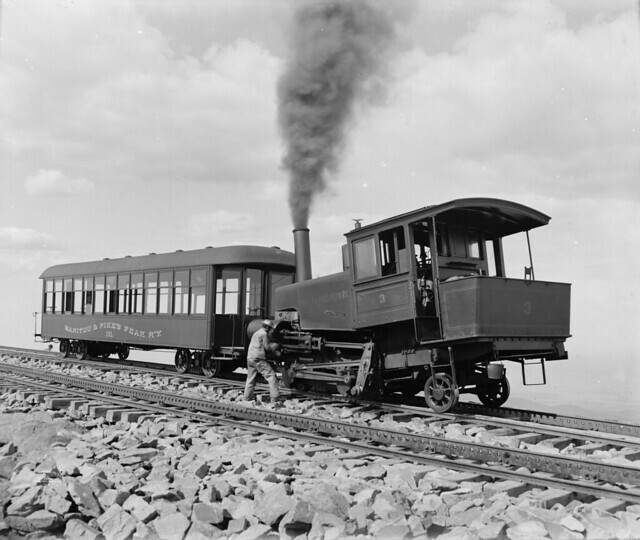 The touring party also took its time in the Rockies, stopping to ascend Pikes Peak via a (still operating) cog railway out of Manitou Springs. Ill-equipped for the high-altitude temperatures, the tourists who went to the mountaintop all wore billowing red blankets stamped with the initials of the Pullman Palace Cars. Johnston wrote that “without doubt some thirty able-bodied citizens so wrapped in red blankets that the letters P.P.C. were worn on the small of the back, walking in solemn procession around the mountain top, was a sight for gods and men” (1892, 131). Charles Cutter (who had so ardently defended excursions) continued what was apparently a continent-spanning trend of nearly missing trains with his nearest miss yet. As the cog train began its descent from Pikes Peak, “somebody caught sight of Mr. Cutler [sic] plunging wildly through the snow on the peak and frantically waving his arms. The train was finally stopped in its downhill course, and the panting librarian climbed aboard, saved from a wintry night near the stars” (San Francisco Chronicle 1891). Sadly, the westward passage over the mountains claimed one victim, none other than tour organizer Frank P. Hill. “Some of the more profane say that his lungs, long used to New Jersey malaria, could not stand the pure air of 10,000 feet elevation; but the more thoughtful said that that pressure of work in getting up the trip had exhausted his strength” (Johnston 1892, 132). After meticulously planning the itinerary, the ALA Secretary had to disembark to recover, waiting for the eastward train to pick him back up when the conference had ended. Despite this disappointment, his career prospered, and Mr. Hill later served as ALA President and eventually left Newark to become the head of the Brooklyn Public Library. Once the train made it past the transcontinental divide, it crossed the Territory of Utah and into the state of Nevada, where the librarians were surprised to find a small public library in the remote and dusty whistlestop town of Carlin. Johnston wrote that it was “like a voice crying in the wilderness, and with one accord we rushed in upon the librarian, and wished him all manner of good luck” (1892, 132). He also noted that the distinguished travelers impressed many of the residents of sparsely populated Nevada. “For at one of the stations,” Johnston wrote “we overheard a citizen inviting a friend to come and inspect our party, on the ground that ‘it was the smartest lot of people which had ever been seen in the State.’ ‘Are they all from Boston?’ asked the other. “Nop, they are not, for they don’t all wear glasses; but they look almighty wise just the same’” (1892, 132). One other librarian was waylaid mid-tour, but of his own volition: Samuel Scudder disembarked in Truckee to catch grasshoppers before catching up a day or two later (San Francisco Chronicle 1891). While he did dabble in librarianship at both Harvard and the Boston Society of Natural History, he is better known today for his prolific career as an entomologist and paleontologist, so this should come as no surprise. When the train arrived in California, it was met by a greeting party in Truckee made up of distinguished California librarians, who delivered fresh salmon, quail, figs, peaches, and grapes to the travelers, who offered in return black coffee and cigars. The easterners and westerners breakfasted together on the ride down from the mountains into Sacramento. They stopped in Rocklin to saw off a heavily-laden branch from an orange tree, which they suspended from the ceiling of one of the rail cars as decoration (Sacramento Daily Record 1891). The westward passage of the train ended in Oakland. The bay was not yet bridged, so the librarians disembarked to conclude their journey: “A short wait for the ferry, a short ride in the cool fog drawing in from the sea, a twinkling of electric lights and a jingling of bells, the wheels ceased churning the water, and our journey was done” (Johnston 1892, 133). In a repeat of the debate at the 1890 conference, there was a quarrel during the conference’s eighth session over where the Association should meet next. The committee tasked with determining the next host location was divided on the subject. ALA President Green suggested Nantucket, paired with a chartered steamship cruise of the Atlantic Coast (ALA 1892a, 117). But ultimately the debate came down to an impasse between two diametrically opposing ideas: either meeting in Washington, D.C, which was conveniently located for maximum attendance, or at a remote resort, far away from the distractions and excursions of big cities. The choice of Washington won the day, but the anti-city faction was not done raising objections. Later in the same eighth session, Oberlin College’s Azariah Root moved that the conference not be officially adjourned until the excursion train had arrived in Chicago. 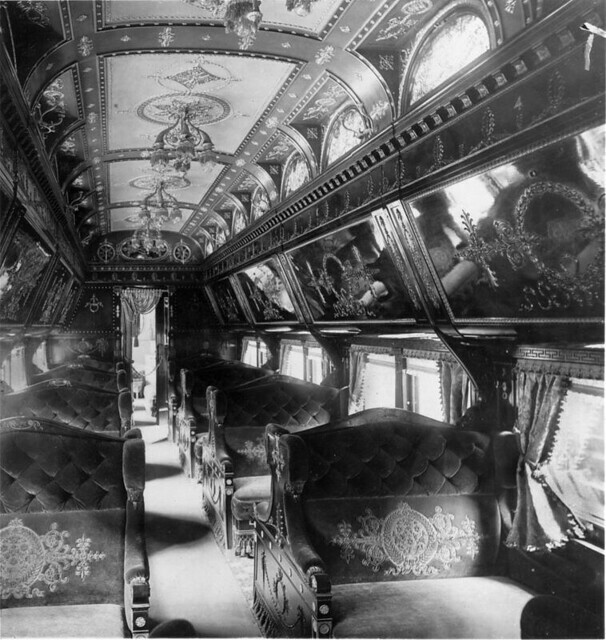 The train’s Composite Smoking Car would serve as a traveling conference so that the ALA could issue official edicts thanking every locality that hosted them along the way. Finally, the California tour ended with a stay at San Diego’s opulent Hotel Del Coronado, then just three years old. According to Ahern (1892, 150-51), the Southern California adventures included shark sightings, impromptu dances, a border crossing into Tijuana, and one incident in Redlands where an unnamed young women of the touring party attempted to steal a burro. The Hotel Del Coronado, circa 1900, by William Henry Jackson (1843-1942), photographer, courtesy Wikimedia Commons. While all of this touring and sightseeing seems superfluous, it’s worth noting that in many of the stops the train made, the local paper covered the arrival of the librarians as a newsworthy event and mayors and local library officials came out to shake their hands. The tour served to increase the profile of libraries and librarians in these emerging communities when the public library movement was still in a fledgling state. Papers in Sacramento, San Francisco, Los Angeles, Riverside, San Diego, and Topeka all covered the arrival of the touring party as if it were a major event. Among those opposed to Washington hosting the conference were Dr. William Poole, who objected because it was “too hot” and “because in the South there were few libraries” (ALA 1892, 125). Frank P. Hill, who had been retrieved by the return train after recovering his health, also objected, and felt that the Association could override the vote in San Francisco whenever it wanted. Colonel W.H. Lowdermilk, a DC-based bookseller, and Miss E.W. Sherman of the Library Bureau, defended the “devoted librarians” in the south who were striving to improve circumstances there, and felt situating the conference in a place they could attend was for the best, and would help promote the cause of public libraries in the South. A compromise of sorts was reached: a motion was carried that the “first sessions of the conference would be held at some quiet resort, preferably Annapolis” before moving into Washington (ALA 1892, 125). The 1891 Conference was officially adjourned after a meeting in Chicago, though many librarians stayed on until the train arrived on the East Coast. 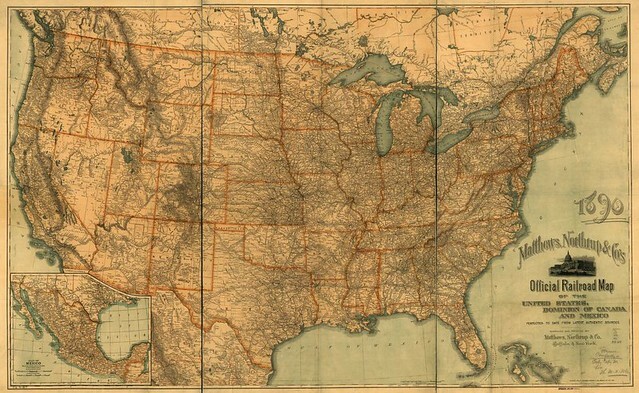 Ultimately, the tour covered a total distance of 8,116 miles through 12 states and three territories (ALA 1891, 31). And as for the 1892 conference? It was ultimately moved to a resort hotel in Lakewood in northern New Jersey. Of the 260 attendees of the 1892 conference, only three came from Southern states (ALA 1892b, 104). But there were day trips to Baltimore, Washington, and post-conference excursions into Virginia. As for California, the American Library Association would not return until the Pasadena Conference of 1911. That time, Frank P. Hill did make it all the way west. The industrious Herbert Putnam, by then the Librarian of Congress, did not (ALA 1911, 282). I’m hopping on a plane in a couple hours for Las Vegas for the 2014 edition of the annual conference of the American Library Association. There’s so much going at the conference of thousands, and I’m still figuring out my schedule. But here are the places I’m sure I’ll be. The first day is busy, with the Emerging Leaders cohort of 2014 gathering for a workshop from 8:30 to 3, which leads directly into the Emerging Leaders poster session and reception running from 3-4pm. 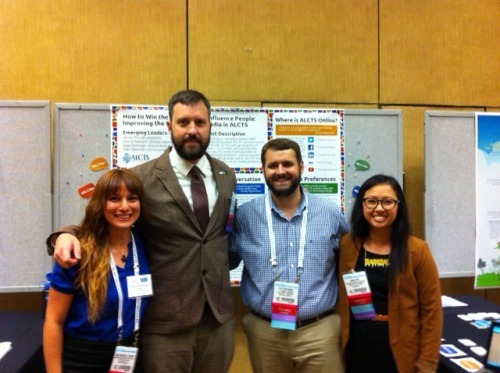 My group — EL Team C, comprising of Annie Pho, Mari Martínez, and Kyle Denlinger — has been working on a social media plan for ALCTS, the ALA division for collections and technical services. 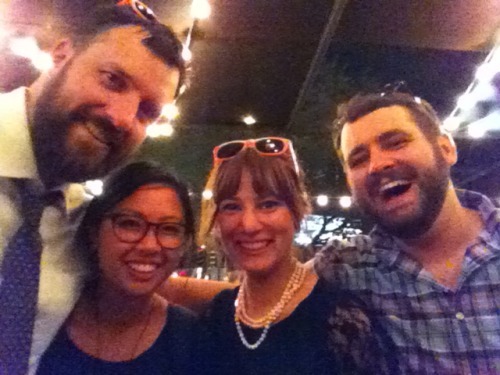 It has been great working with Annie, Mari, and Kyle. We just had a natural chemistry from the start and the process has been very satisfying, even if it did involve herding cats. You can see a preview of our advice for ALCTS — a dozen social media tips we shared on twitter yesterday (under the hashtag #ELCtips) — and if you’re at ALA, please come by the poster session! Friday night? I can’t dance, but I might try. Day two features the hearing on the new draft framework for information literacy instruction. Classroom instruction is a big part of what I do, so this attending is a must. I am also going to seek out the Alexandria Still Burns project to see if I can participate. Otherwise, my Saturday afternoon is up in the air. Saturday night? Tumblarian meet-up, then Afterhours with EveryLibrary and the Librarian Wardrobe book release party. There’s a lot of good stuff going on Sunday. The session I’m most excited about is about threshold concepts, the model of information literacy instruction that heavily influenced the new framework. Two of the presenters — Korey Brunetti and Amy Hofer — had a huge influence on me early in my career when I saw them speak at the CARL Conference in 2010. I’m curious what they’re talking about in 2014. Oh, Monday. Usually the cool down day of the conference, a chance to catch your breath, see a few people you’ve missed, and blow off steam as an attendee at Battledecks (or, as it has transmorphed for 2014, The Library Games). Not this year. Monday morning: I’m a panelist for #TumblarianTalk, moderated by Kate TkaPOW!. Monday afternoon: I’m the moderator, for What I really want to do is direct: First-time library directors discuss their experiences (join us! And be part of the chatter on #iwannadirect). Monday evening, I’ll be heeling it up as one of the agents of the Library Security Agency, or LSA, at The Library Games. For the last couple conferences, Tumblarians have been sharing headshots so we can all recognize each other. 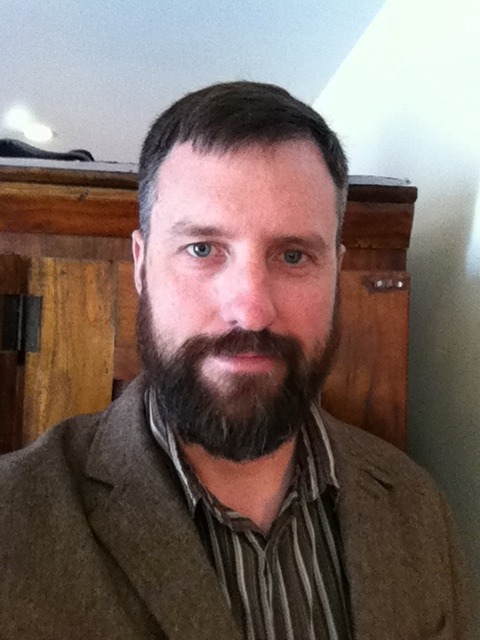 Here’s my face, with my longest-ever beard that I’m taking to the insanely hot Las Vegas, because I am insane. If you see me walking down the hall, please say hi!